William Rowell Derrick was an American artist born in 1857 and is noted mostly for his highly impressionistic oil paintings which provoke a mood strikingly accurate to his subjects. Derrick died in 1941. This pianitng is a charming depiction of a pond at the park with ducks swimming about. The foliage is breathtaking, as the impressionistic details are noted with thicker use of paint and calming colors. The trees are depicted wonderfully with beautiful fall colors. An inspiring painting, which brings about a mood and feeling. A gorgeous scene from the early 20th Century. 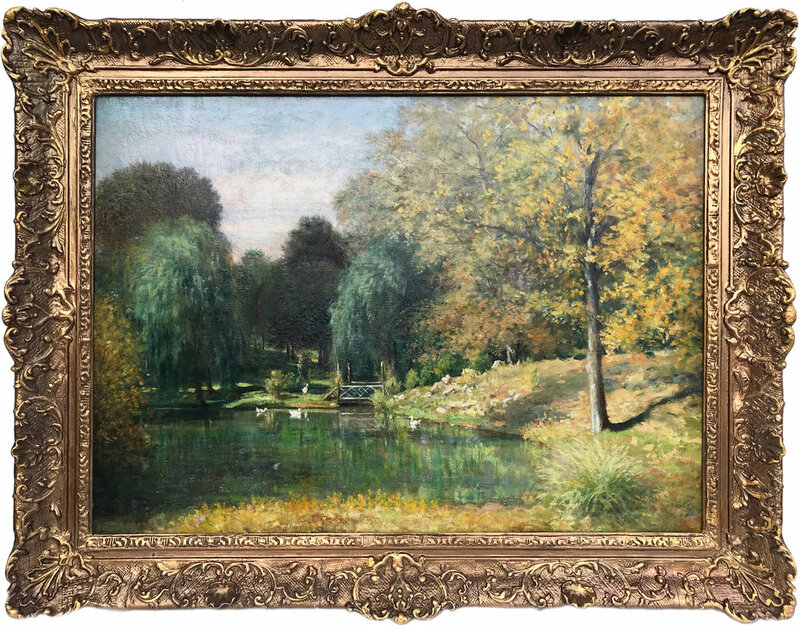 The painting comes displayed in a wonderful ornate wood carved frame and is signed lower left.